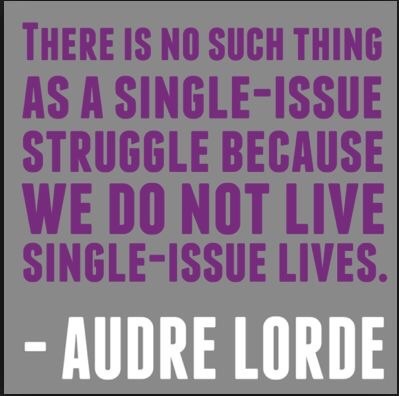 Intersectionality is a concept often used in critical theories to describe the ways in which oppressive institutions (racism, sexism, homophobia, transphobia, ableism, xenophobia, classism, etc.) are interconnected and cannot be examined separately from one another. (Geek Feminism Wiki, n.d.). As discussed we reviewed Anti-Oppression Framework, oppression does not occur in silos. Oppressions reinforce each other. Their intersectionality influence how we experience oppression. We cannot understand how a woman experiences sexism without knowing how her race, sexuality, class, age, etc. What does this look like in real life? Fortunately actress and activist Laverne Cox breaks it down for us in this talk where she discussing being bullied as a trans woman of colour. In this talk, Cox discusses how she has faced sexism, transphobia, and racism often at the same time. Intersectionality dictates that experiences will vary based on the intersecting identities of the individuals in play. For queer people, an important intersection is often race, especially as it relates to family dynamics (Basic Rights Oregon, 2014). This topic is important because we know that racialized youth who identify as LGBTQ2S are over represented in the youth homelessness population. Service providers who work specifically with LGBT youth also report serving a greater number of youth of color, suggesting that—at the very least—homeless youth of color are present in LGBT-specific programs at higher rates (Cray, 2013: 6). It is important to remember that youth you are working with encounter numerous barriers and microaggressions based on their various identities. Below is a fun guide to help us better understand intersectionality. The next module is an exercise that will help illustrate how intersectionality functions and that most of us enjoy privilege based on at least one of our identities. The exercise is called the Power Shuffle.